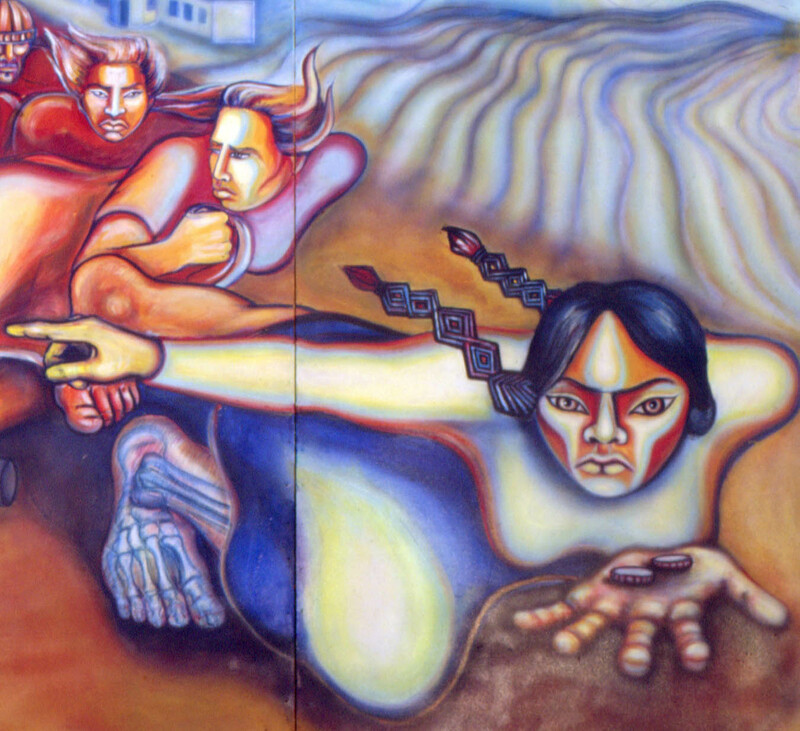 Judith F. Baca, Uprising of the Mujeres (1979). Acrylic on wood, 96 x 288.5 inches. Judith F. Baca’s Uprising of the Mujeres appeared on the Autumn 2011 issue of Signs (volume 37, number 1), which featured a comparative perspectives symposium titled “Gloria E. Anzaldúa, An International Perspective,” edited by Norma E. Cantú. I want to produce artwork that has meaning beyond simple decorative values. I hope to use public space to create public voice, and consciousness about the presence of people who are often the majority of the population but who may not be represented in any visual way. By telling their stories we are giving voice to the voiceless and visualizing the whole of the American story while creating sites of public memory. © 1979 by Judy Baca. Permission to reprint may be obtained only from the artist. Judith F. Baca is an artist, educator, scholar/activist, and community arts pioneer. She is a professor in the Departments of Chicana/o Studies and World Arts and Cultures at the University of California, Los Angeles. She is the cofounder (with Donna Deitch and Christina Schlesinger) and current artistic director of the Social and Public Art Resource Center, an organization that has been creating sites of public memory since 1976. Recent awards include the 2011 Outstanding Latino/a Cultural Award in Fine Arts from the American Association of Hispanics in Higher Education and the 2010 National Award in Public Art from Americans for the Arts. Two of her ongoing projects are The Great Wall of Los Angeles, the longest mural in the world, which depicts the contributions made by ethnic and diverse people to the history of America (with a focus on California), and World Wall: A Vision of the Future Without Fear, a traveling mural on the theme of the material and spiritual transformation of a society toward peace, which adds a panel by a native artist from each country it travels to.